FTDI was founded in Scotland in the early 1990s by the experienced ASIC developer, Fred Dart. The Head Offi ce is located in Glasgow, with regional sales and support offi ces in the USA, Taiwan and China and a development centre in Singapore. "Design Made Easy" and "Bridging Technologies". They can now look back on over 15 years of USB experience. Even in the future, USB will remain a major topic for FTDI. 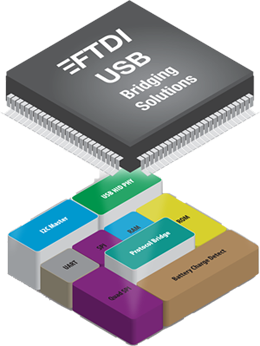 Through its new USB 3.0 products, FTDI shows the course for the coming years. "FTDI Chip puts itself in the position of the hardware developers, so that each module not only offers the highest performance but also guarantees simple implementation and a minimum development cost," says Fred Dart, CEO of FTDI Chip. The latest additions to their portfolio are the graphics chips and microcontrollers. The "EVE" FT800 graphics chip is the fi rst "non-USB product" to be developed. The aim is to replace the segment LCDs with full-colour TFT displays without using expensive controllers to control the display. With the FT900, a powerful controller with its own 32-bit core has been developed. The motto is also valid here: Design Made Easy! Many simple examples and good documentation allow a quick start with the new product.